Atheodox Jew: The pseudoscience of Kabbalah and how I thought I was "Neo"
The pseudoscience of Kabbalah and how I thought I was "Neo"
What "happens" when we daven or do mitzvot? In my view, what happens is that we experience psychological and social effects - nothing more and nothing less. Which is not to minimize these effects - they undoubtedly have a big impact. But other approaches make further claims. In the non-mystical theological approach, the claim is that Hashem "hears" and "sees" what we do, and judges us more favorably when we follow His commands. And in the mystical approach - which I want to focus on here, the claim is that Hashem gives us "pathways" to achieve spiritual goals. So when we recite a prayer just so, or do a mitzvah just so (which can also include having the right kavana/intention), we "stir the Heavens" by sending energy along these pathways, which then has a positive trickle-down effect for us here on Earth. This last approach - I would contend - is actually a quasi-scientific orientation to the world, in the same way that the magical, metaphysical or spiritual-mechanical orientation is quasi-scientific. Mind you, I don't mean in the "evidence-based" idea of science, but rather more in the loose-experimental sense of attempting to discover things that "work". When we turn on a light switch, the light comes on. Likewise, the belief is that there's a built-in infrastructure of nonphysical/unseen "wiring" in place which permeates the universe (including spiritual dimensions), and what we need to do is figure out how and where to construct the right "switches" to take advantage of this spiritual infrastructure and produce the desired effects. I was once very much taken in by this approach. After all, we live in a world of technology. We appreciate knowledge and activities which "do" things. So let's say I put on Tefillin. I could say that the main reason to do it is that it's a "mitzvah", and that Hashem judges me favorably as a result of putting it on, because I've fulfilled the command to a "T". But to me, the Commander/King motif always smacked of metaphorical, anthropomorphic religious-speak, the idea of the Judge on High who scrutinizes my mitzvah observance and awards me accordingly. It's a model that almost from the outset of my "frum career" I found very difficult to buy into. How else to understand it then? Well, I could say that putting on Tefillin is personally meaningful, that I am binding myself to Hashem as it were, that each aspect of it is symbolic of a lofty religious concept. Well, that may be beautiful, but what bread does it bake, really? What does it "do"? If it's all meaning and symbolism, then isn't it ultimately arbitrary? To me, this was the most insipid and uninspiring approach to Judaism - the "symbolic" approach. How weak! How arbitrary! What a waste of time! And so the Kabbalistic approach was much more my speed. Finally, an approach that talks about the mitzvot "doing" something! The mitzvot are a "technology" of sorts. They manipulate unseen energies. All we have to do now is "reveal" those energies, reveal the hidden infrastructure, and we can remove all the kashyas (questions of halacha), all the religious talk, all the metaphors, and know precisely what to do. It's like in The Matrix when Neo had his epiphany and was able to "see" the computer code underlying everything, unmask the reality surrounding us. That was essentially my dream - to become the "Neo" of the Torah world. After all, if Tuma and Kedusha are real, if they're really out there, if they're energies which interface with the physical world, then we should at least be able to find them, detect them - right? That's what I thought at least, and I literally wanted to invent the "Tum-ometer" and "Kedush-ometer", to hone in on the physical manifestation of these energies and measure them, conduct experiments to demonstrate their presence - and in so doing be able to reveal the unseen reality to the world. What's really more reasonable, more plausible? That I merely believe that there are "hidden energies" which are streaming all around us, and the mitzvot channel those energies, and that's the reason science has never and will never discover it. Because it all boils down to self-suggestion. Answer number 2 turned out to be my great "epiphany". Yes, it was exciting to think that locked within Torah lie deep secrets about the nature of reality, that after thousands of years we're finally on the cusp of revealing those secrets, and that this revelation is part of ushering a new redemptive era. Very exciting indeed! But when push comes to shove, to go around speculating about the "technology of Torah"... Imagine if someone talked about the "technology of the Koran" and said the exact same thing but plugged in different words. It would sound to me like a person who may be creative, possibly even nice, but at the same time pretty obviously self-deluded. Well, that's precisely how I was coming off to people. And for good reason. So it took some time, but eventually I simply let it go. And I feel substantially "lighter" for it. As exciting as it was, the feeling that I had to prove the cosmic "Truth" of Torah weighed on me. I can't tell you how freeing it's been to get that off my back, to have nothing more to prove and simply be open to "what is", and enjoy Judaism for what it is - and not pretend it's something it's not. The flaw in your argument is to apply physical standards to spiritual entities. This is a mistake because there is no reason for spiritual entities to follow physical rules. Your mention of tumah and tahara are a great example. If they were physical entities they would have to follow specific rules. After all, you don't start a fire by throwing water really really quickly onto wood. It's against the rules. But if there are physical rules how is it that a metzora who's completely covered 100% is tahor but if 1% of him heals up he's now tamei? How could Chazal have come up with tumah d'rabbanon? I can't just invent physical phenomena and expect people to work with them. If you've never read The Thirteen Petaled Rose by Rav Adin Steinsaltz give it a try. He comes as close as anyone to explaining, in a coherent fashion, the role of the spiritual in Judaism and how it works. Thanks for the reading recommendation. I'll see if I can get my hands on a copy. My sense has always been that that creating a stark division between "physical" and "spiritual" is a philosophical misstep - it's all just one reality, albeit with different manifestations (like a very palpable clump of dirt vs. invisible radio waves) and perhaps allowing for things in different "dimensions". Just that before, I assumed that Kedusha - similar maybe to something like "Chi" - was an entity "out there", which is why it's able to impact us in ways that we can "feel" and "sense" physically. My mistake - I now realize - was in assuming that just because you can "feel" something doesn't mean that it originated from outside of you. Rather, what we feel is often a product of the mind. Which is pretty darn amazing - and powerful, but it doesn't mean we need to incorrectly assign the effect to "entities" existing outside the mind and body. That's essentially what I realized. Regarding something like the Metzora and the seemingly counterintuitive rules involved, the question to ask is what was the mindset of the time? If you think about it, "germ theory" is only 180 years old or thereabouts. Before that, you had ideas like the "four humors" to explain disease. Now try to imagine how people in Bronze Age times might have understood these things - not so simple! But it does seem fairly obvious that they must have construed that some sort of unseen and perhaps evil "forces" were at work. And it's understandable that their techniques for dealing with it might not always be logical to our modern eyes. They might involve quarantine, but they might also involve strands of red thread. They might involve looking at "spots", but they might also say that so long as there are no "spots", it's effectively not there. And the intellectual misstep that people make - in my opinion, is to say that because something seems "unusual" (illogical, foreign, even crazy) to us - this necessarily points to the existence of a "spiritual" dimension. It may be, but I think there are far simpler, more down-to-earth explanations. The metzora is a good example of why physical rules don't work. If you have a copy or can get one read Rav Shimshon Rafael Hirsch's commentary on it. He goes on at length to show that this was not a physical disease. A few brief examples: the person isn't put into quarantine until he's checked, neither is the affected house locked up until declared infected. A metzora covered head to toe is no longer "contagious". The Talmud goes further telling us that a groom isn't put into quarantine during the Sheva Berachos week nor are people checked during pilgrimages to Yerushalayim. It makes no sense unless it's a sign of something else. The best quickie explanation I heard was this: look at a human brain. What do you see? A layperson sees a mass of what looked like cold cooked noodles. A family physician sees lobes and a brainstem. A neurologist sees gyri, loci, pyramids, etc. A pathologist sees axons, endplates, neurotransmitters, etc. Yet it's all the same brain. A family physician seeing only the lobes doesn't negate the existence of the underlying structures he doesn't appreciate as much as the neurologist or neurosurgeon. This is the essence of Kabbala which has been distorted nowadays. It's the neurosurgery of Judaism. On a basic level, when you say a beracha you are asking permission from God or praising Him for something. Once you have learned deeper matters in Judaism you can start to appreciate the underlying anatomy of the beracha, the spiritual energies you interact with when you say one. Yes there's a certain selfish energy at some level, you feel good because YOU want to. But sometimes it does come from outside and the trick, the real trick, is to figure out which is which. Garnel, I can appreciate the neurosurgery metaphor for looking at Kabbalah relative to other areas of Torah. But to me, a Kabbalist is more like a surgeon who speaks in detail about a part of the body no one has ever seen, and purports to perform surgery on it by taking a scalpel and making incisions into thin air. Just because someone has worked out a detailed description and methodology, and believes wholeheartedly that it's real, doesn't make it real. Again, I turn to the principle of "simplest explanation". I'd rather say that the unusual rules of Tuma and Tahara reflect a mindset that doesn't follow our rules of modern logic, that they reflect a world rife with gods, taboos, superstitions and folk medicine. I'd "rather" say that not because I have a chip on my shoulder or want to "prove it wrong", but because I honestly think that's the explanation with the greatest likelihood. Supernatural claims invariably have down-to-earth explanations. Is it possible that this is because we're surrounded by kabbalist hucksters who have taken the body of knowledge and trivialized it? Yes, your surgeon performing in thin air is a fraud. Now consider this: the locus ceruleus, an important part of the brain. I could identify it briefly when I took neuroanatomy in medical school. If I pulled out a cadaver brain and pointed it out to you (I assume you have no anatomy training, if you do the forgive me and pretend you don't), what would you see? A bunch of grey mush. You'd have to take it on faith that the little swirl in the midst of a bunch of other swirls was what I was saying it was. That's REAL kabbala, not the stuff we read about on the internet. Real kabbala isn't about amulets or influencing "the spheres" but about the deepest understanding of Torah and how the spiritual nature of the universe works. 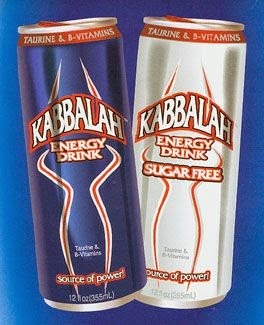 Despite the accompanying "Kabbalah Water" image, which is hucksterism par excellence, I am referring to authentic Kabbalah - not the commercial, pop-psychology, New Age variety. My reluctant but fairly confident conclusion is that yes, even the heavy hitters are "cutting into air" as it were. Though 1) I don't imagine they're knowingly deceiving people - I give people the benefit of the doubt that they really do believe it, and 2) even if the spiritual structures they describe do not exist "out there", I think such people can still be "spiritual masters" in the sense of living with a high degree of kavanah and being special individuals on many counts. I'm telling you - I'd love to be proven wrong on this, but I'm afraid I'm not holding my breath either. We are creatures of our age, and our age is technological. Our first question is, "What does this do?" While I imagine that pre-moderns asked the same question, I also imagine that they asked, "What does this mean?" And that for them, the two questions were distinct. I think that for us moderns, the two questions are close to being the same question: what it means is what it does. Judaism (like Christianity) has always had a healthy suspicion of anyone who makes these two questions the same. We don't like "magic", or at least we're afraid of it, in part because it purports to create a technology by which we can command higher powers for our own purposes, and many of us are afraid (outwardly or secretly) that such a thing is possible. But we're also afraid that if we ever possessed the technology to command the higher powers, then the higher powers would lose their meaning. (Hence my fear around "Na Nach Nachman".) So, when we tell a story about an ancient holy man who could pray to make it rain, we want to stress that the person was righteous and worthy to have his prayers answered ... and even then it makes us a little nervous that someone might possess the "magic" to have his prayers answered when the same prayer coming from the rest of us would be ignored. All this is to say that "what it means" is a much more difficult and complicated question than "how does it work." It's more difficult in part because "how does it work" is largely an objective and timeless question, while "what it means" is both subjective and a different question from era to era and from person to person. Yet I would argue that the search for meaning is itself universal, and that it's helpful to conduct this search together, following patters that seem to have been more or less successful in the past. I'd also add "what actually exists (i.e. outside the mind)" and "what really happened (i.e. in history)" to the list of objective questions. We may never get answers to all of these, and we may choose to construct beliefs and meanings around them which change over time, but in theory these are factual.